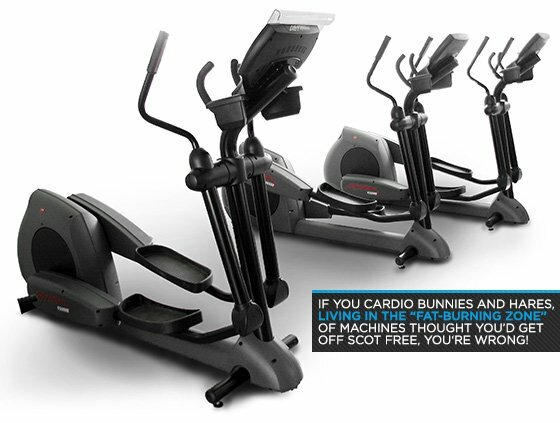 What the heck is cardio, anyway? It's a poorly chosen word to describe what is, for many, the wrong way to train. Turn off the treadmill television and enter a brave new world of training! There is a war going on in the fitness community. Memes are launched around social media on a daily basis saying, "You can't flex cardio" or "The only running you should do is to the squat rack." And it seems I can't go a week without seeing a furious blog post with a title like "99 Reasons You Shouldn't Run," always including a side-by-side photo comparison comparing a frail-looking distance runner and a jacked sprinter or weightlifter. Authors and commenters claim a host of negative health effects, from muscle-wasting to elevated cortisol levels. Even though I enjoy both running and weight training, I understand where all the hate comes from. Part of it is that when someone decides to go to the gym after years away, they usually don't start in the weight room. They start with hour after hour of low-to-moderate intensity cardio, on either a treadmill or an elliptical. 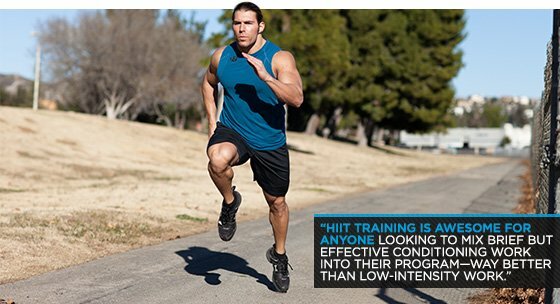 And for better or worse, the go-to image in most mainstream health and fitness ads is someone jogging, or "yogging." Maybe because I have a foot in both worlds, I can't help but feel like this turf battle isn't helping anyone on either side. Weightlifters keep treating conditioning work like a mistake, or at best, a necessary evil in their program. Runners keep avoiding the weight room like it's full of killer bees. And all the while, people who just want to look and feel better end up believing they have to choose one or the other—which isn't the case. What's the solution? We need a new way of thinking. We need to move beyond cardio. The word "cardio" is derived from the Greek word kardia, which means heart. It's short for "cardiovascular" or "cardiology" and refers to anything related to the heart and circulatory system. Therefore, any form of exercise that increases the heart rate or has cardiovascular benefits is technically cardio, from skipping barefoot in the park to doing barbell complexes until you heave. Even though cardio is synonymous for many people with "low intensity," the word itself doesn't state anything about the difficulty of the exercise session. Which brings me to the main question: When's the last time you sweated through a difficult workout simply because you wanted to do something good for your heart? That's what I thought. Your goals were probably something more like weight loss—which is better for your heart than any specific exercise—improved general health, athleticism and/or strength, or to get better at an activity. The word "cardio" doesn't capture any of these things. We need to retire the word, like how the noun "aerobics" thankfully fell out of favor a few years ago. Cardio has become too political. It means too much, and yet, it also means too little. So what do we use in a post-cardio world? Here are three options. A tough cousin of low-intensity cardio is high intensity interval training (HIIT), which involves cardio-type workouts with alternating intervals of hard and easy efforts. Research has shown that HIIT protocols have greater fat loss and cardiovascular benefits than low-intensity efforts. A now legendary method, the Tabata Protocol, consists of maxing out for 20 seconds, followed by 10 seconds rests, and repeated for eight rounds. This has been shown to improve VO2 max and elevate excess post-exercise oxygen consumption (EPOC) to greater levels than low-intensity sessions lasting as long as an hour. A greater EPOC increases the "afterburn" effect, resulting in a greater total number of calories burned in addition to those burned during the exercise session. If you're a lifter who loves hating on "cardio," don't bother putting the standard 30-45 min jog or elliptical in your program. Do HIIT or complexes instead, and let the runners run. I'm sorry if I just made you feel like you're wasting five hours of your life each week. The body is an amazing machine and will adapt in different ways depending on the type of training you do. If you stick with 185 pounds for 3 sets of 10 in the bench press, your body will learn how to perform the exercise with as little effort as possible. Improving efficiency is how the body saves energy for more important situations, such as surviving a zombie apocalypse. Running is no different. Running 30 minutes at a moderate intensity will initially stimulate heart and cellular adaptations, but this will cease once the adaptations make the body more efficient. This means the energy you'd use to run 30 minutes today is actually less than the energy you used before your body adapted. Therefore, in order to induce more positive cardiovascular adaptations or more calories burned, you simply must run farther or run at a higher intensity. If your goal is to get better at distance running, and you have the time to do so, that's great. But if your goal is simply to lose weight or become more athletic in a limited time frame, a steady diet of steady-state cardio isn't the best way to get there. You need to increase the intensity—this means no more television at the gym!—and commit yourself to a more balanced training style that incorporates a healthy amount of strength training. If you're endurance training or living on the elliptical simply because you think it's the best way to burn calories, you're wrong. So do less "cardio" and focus on progressing in weight training and high-intensity training. Option 3 /// Do What You Enjoy, Dammit! Make no mistake: Moderate intensity aerobic training and jogging definitely have their place. Middle- and long-distance runners, for example, perform different running workouts to improve their body's efficiency for racing. Much of their training volume consists of easy-paced running, also known as aerobic training (~60 percent max heart rate). 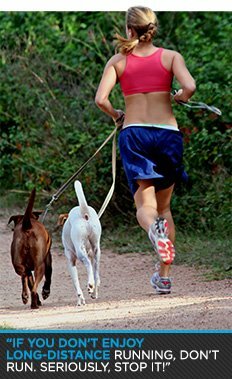 Under a running training protocol, low-intensity jogging has a functional purpose, which is to improve recovery between tougher workouts, and to promote cardiovascular adaptations specific to running faster race times. Competitive runners (hopefully) do not run at this intensity to lose weight, even though many non-runners think this is the way to lose weight. So why do runners run, if not to lose weight? Because they enjoy it! No, really, they do, just like basketball players enjoy basketball and powerlifters enjoy the big lifts. If you don't enjoy long-distance running, don't run. Seriously, stop it. You wouldn't step into the octagon or a rugby scrum unless you were serious about those sports, would you? So why suffer hour after hour when you'd rather be anywhere in the world? If we stop thinking in terms of "cardio," maybe some people will feel more comfortable replacing treadmill television time with activities they enjoy. This could be racquetball, hiking, sword-juggling, ultimate Frisbee, tag with their kids—whatever they want. Fill your life with these activities. Then train at a higher intensity so you can minimize your gym time and enjoy those activities more. If you're running/biking/endurance training because you enjoy it, cool. These are legitimate sporting challenges. But don't mistake what you're doing for "cardio." Enjoy what you do, train to get better at it, and don't hate on other people for following their passions. Just follow yours.